[Newswave] The ‘art exhibition’ of President Jung Myeong Seok, Christian Gospel Mission, has begun. He is the artist who embraced art as a religious leader. His experimental spirit, which boldly tears down the walls of genre and strives to achieve aesthetic unity, is outstanding. ▲ Painting, top left: Destiny was selected as Jung’s feature work at the International Art Fair in 2011, and it received praise from people around the world. Through this painting, President Jung Myeong Seok expressed the destiny of the weak before the strong. If you look at the lines in this painting, they [seem to] depict the musical notes of Beethoven’s Symphony, “The Fate of Destiny”. The top portion of the painting was drawn with bold lines and the bottom portion was drawn softly to express the sorrow [of life]. Painting, right: A painting of a palm tree. Because of his desire to harmonize distinct subjects, he uses calligraphy as an element of his drawing. Painting, bottom left: He painted these pine trees using minimal artistic techniques and without including unnecessary details. The artist added a poem, which integrates his thoughts into the painting. How would a world of art—where life becomes art and art becomes life, created through communion with the Divine Being—come to be? As a religious leader, he incorporates art with religion and his style is unique and free, without the restrictions of formality and genre. The exhibition of his unique world of art has begun. This artist is President Jung Myeong Seok of Christian Gospel Mission. 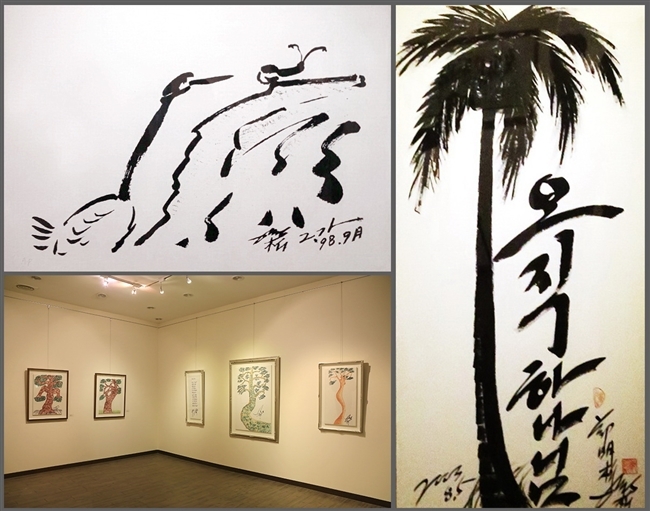 The exhibition of his artwork at Gusang Art Museum in Wolmyeongdong Keumsan-gun in Chungnam Province began on February 21. Besides the palm trees, cliffs and pine trees usually drawn by Jung Myeong Seok, you can see a number of other paintings as well. President Jung Myeong Seok expressed his view on art: “You must know the Holy Son Jesus, Who is the way, the truth, and the life. Then you will be able to create art and make your life into a perfect work of art.” In his artwork, his philosophy is embodied and freedom unleashed in the learning of the truth which is alive and breathing in his paintings. President Jung Myeong Seok has been active in his artistic activities by exhibiting his calligraphy and a number of his paintings in this nation as well as in England, France, Germany and Argentina. In 1995 he began his literary career with the publication of the monthly magazine, The Trend of Literature, and he became a published poet. His books of poetry, Woman of Poetry and Speaking Through Poetry, which were published last July, have also become best sellers. Ten of his poems have been registered in the Unabridged Korean Poetry Dictionary (2011), which covers 100 years of the history of Korean poetry. His biggest works of literature are The Word of Salvation, his sermon collections, The Word of Life and his proverb book, Heaven’s Word, My Word. He has studied the Bible for 50 years and continues to do so while serving as the President of Christian Gospel Mission and President of the International Cultural Art and Peace Association.